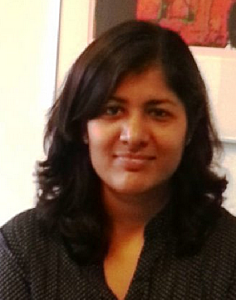 Priyanka left the ORL in June 2018. She started to work at bsi. (British Standarts Institution) in July 2018. In total knee replacement, implant components can be fixated in the body using bone cement. Although total knee replacement is a successful orthopaedic intervention, the reconstruction eventually will fail, requiring revision surgery. The aim of this project is to investigate how the process of implant loosening can be postponed. This project is a collaborative effort of the Department of Orthopedics of the SUNY Upstate Medical University in Syracuse, NY, and the Orthopaedic Research Laboratory (ORL) of the Radboud University Nijmegen Medical Centre. Within this project, experimental techniques (SUNY Upstate) are combined with computational modeling (ORL) to study the load transfer mechanisms and motion at the level of the bone trabeculae (~1mm) and below, see figure 1. We have been performing in vitro experiments on small components of bone-implant interfaces in which small (micron scale) loading is applied in tension, compression, and shear. We incorporate digital image correlation techniques to map local strain fields subjected to loading. The long-term goal here is to improve our understanding of local motions at the interface and how motion is related to bony response, by combining information from experimental and computational models on laboratory prepared and post-mortem retrieved specimens. 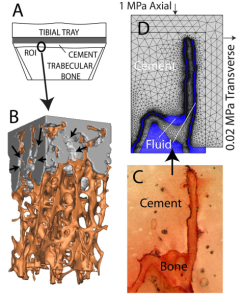 One of my tasks is to include computational modeling of the cement-bone interface of cement tibial knee implants.